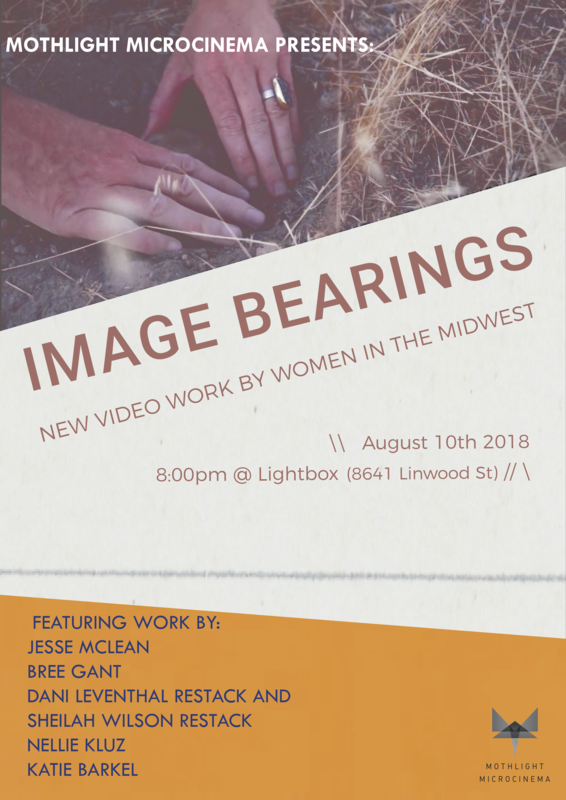 Image Bearings is an experimental shorts program of new work by women who call the Midwest home. The weight of performance and the comfort of the familiar often encountered by women in this region is a running theme in each work. Each artist interacts with the large flat spaces of the geography by questioning its normalcy and their actions that fall outside that realm. Where each artist feels enamored and repelled is revealed by placing the lens on the water, people, postcards, and stillness of the region. The movement of images addresses the certainty that in pausing there is rust and only in the self-reflective can the idea of the midwestern woman be expanded. The movements are documented in woods, houses, hands, and passion plays, all changing as the Midwest always has: so slow it’s fast. Suggested Donation: $7-$10 at door. Jesse McLean: A primary focus of all my work is the power-and the failure-of the mediated experience to bring people together. I am motivated by a deep curiosity regarding human behavior and the ways intimacies and connections are formed in an age of mediated experience. Recent projects explore the immersion into digital culture and the fraught relationships people have with technology we both rely on and resent, and in contrasting the finite capacities of the nonhuman with infinite human desires. Bree Gant is a Detroit-bred multidisciplinary artist and photographer reimagining African diasporan visual culture. After graduating from Howard University in 2011 with a BA in Film, she returned home and began shooting the underground art and hip-hop scenes. Gant’s street style blogging with Rock City Lookbook lead to pop up activations at the Detroit Design Festival ‘14 and Allied Media Conference 2014-16. In 2016, Gant received a Detroit Narrative Agency Seed Grant to produce a web series about riding the bus and won a Knight Arts Challenge Matching Grant to produce a suite of dance concept videos. Gant is currently a Teaching Artist in Residence with Detroit Future Schools. Dani and Sheilah Restack have embarked on an artistic relationship that is formally and emotionally adjacent to their domestic lives, a quotidian zone they share with their young daughter Rose. Both artists have established careers on their own. Neither Dani’ video work or Wilson’s multimedia performance and installation work could exactly prepare us for the force of the women’s collaborative efforts. – Michael Sicinski, Cinema Scope, 2017. Dani’s work is made with an emotional logic, questioning cultural, personal and animal realities. She got her MFA in Film/Video at Bard College in 2010. She has screened at the Union Docs, Oberhausen, Rotterdam, MoMA PS1, Anthology Film Archives, Views from the Avant-Garde, and Projections. Sheilah uses photography, video, and text as performative and documentary tools to analyze the traces between history, story, and the land. Sheilah got her MFA from Goldsmith College in London 2005. She has had exhibitions at Ortega y Gasset Projects, The Knockdown Center, Queen Elizabeth Park, New Zealand and the Albuquerque Museum. Their recent collaborations have shown at the 2017 Whitney Biennial, Iceberg Projects Chicago, Toronto International Film Festival, Images Film Festival, Toronto, Lyric Theater, Carrizozo, NM, Leslie Lohman Project Space, NYC and The Columbus Museum of Art, Ohio. Nellie Kluz is a filmmaker and artist based in Chicago. Using curiosity, observation, and analysis, she records and interprets various locations and communities – focusing on social interactions, belief systems, and material realities. Her films have screened at venues like the Full Frame Film Festival, Festival de Popoli, the Chicago Underground Film Festival, Camden International Film Festival, the Independent Film Festival Boston, the Maryland Film Festival, The DocYard, the Sidewalk Film Festival, Rooftop Films and others. She was named one of Filmmaker Magazine’s “25 Faces of Independent Film” for 2017. Katie Barkel is a Detroit-based filmmaker and educator. She has a B.A. in Film & Video Studies from the University of Michigan. Her works have screened at Ann Arbor Film Festival, Museum of Contemporary Art Detroit, Media City Film Festival, MoMA’s PopRally, and in other spaces across North America. In 2015, she completed her first feature-length documentary, Writer’s Block in the Rivera Court, which premiered at the Detroit Film Theater. Katie is a part of Hamtramck Free School, a founding member of Film Fatales Detroit, and a teacher of video art and production at College for Creative Studies.